Welcome to "Bouken Kazoku"! It is located in Kutchan-cho where the Niseko mountains spreads out on Mt. Yotei. Mt. Youtei and Siribetsu River will welcome you! Ikada Rafting feels like very first time! Here was a elementary school once. Goemonburo(old style bath) heals you! 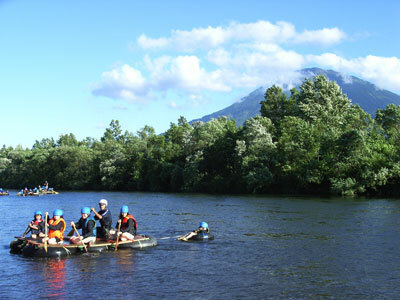 'Bouken Kazoku' is located in Kutchan-cho where the Niseko mountains spreads out on Mt. Yotei and the west side in the southwest of Hokkaido. They are also the nature and life experience center which can do various experiences with the institution to which the image of the wooden school building for 70 years is made as for the maximum remnants, and stay and experience, and the institution which allotted the sunken hearth hut, the campsite, the snow hut, etc. Build your own raft using tire tubes, wooden planks and bamboo poles, all held together by rope work which we will teach you. Then, enjoy the sights of nature as you cruise down the Shiribetsu River. Dive right into the river for a refreshing summer swim or simply float along with the flow of the river. Will you experience the excitement of the Shiribetsu? Hike 20 minutes along a mountain path to find a 500m long lake surrounded by forest. It is a sulphurous hot spring surrounded by streams and Mother Nature. Bathe in the mud and then relax in another, clear hot spring. Your skin will be smooth as silk afterwards! Trout, char, yamabe and other fish await in the clear streams of Hokkaido. Enjoy nature as you fish and learn more about the river and aquatic life. You can use a fishing rod or attempt to catch fish with your bare hands (it’s possible)! (wood-fired Japanese bath)Treat yourself to some precious alone time as you luxuriate in the hot bath while leisurely listening to the sounds of birds and the wind. 4 years in the making, the Irori house offers you the opportunity to live in a building with a traditional sunken hearth. Gather around the hearth to cook and eat dinner and then sleep on futons around the glowing hearth. Make tasty additive-free sausages with your own hands! Add your own spices and fill your sausage casings! Once done, smoke them to add more flavor and color to create authentic sausages. Capacity: 35 people Rooms for groups, families, different genders and Irori-goya (house with a traditional sunken hearth [special price]) are available.